Android 4.3 comes with a new camera interface, nothing else appears to be changed. 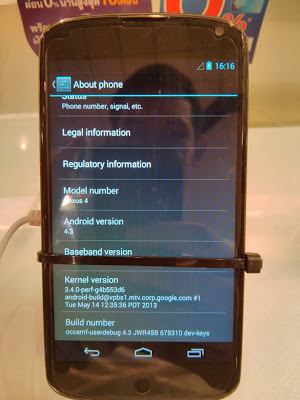 The Android 4.3 has been spotted at a Thailand Mobile Expo. The 4.3 upgrade seems to have no other major change in the Android dynamics other than the Camera interface, which Google has spruced up a little. If you check out the image above you will notice that the build number mentioned is JWR45B and the kernel was compiled on May 14, which gives the impression that this is quite a recent build. The video though very noisy clearly shows the changes in the camera App. The old circular touch menu has been replaced by one where the icons are presented in an arc. Navigation, it seems, is to be done by holding a finger over the menu item, which opens up deeper settings. Even when the user moves into deeper levels of the settings, they can easily come back to an earlier stage by sliding the finger down. As seen in the video, this one will take lot of practise before you can get a swing at it. However it looks more elegant and graceful then the earlier circular touch menu. Now with the spotting of the 4.3 build on Android, the development and launch of Key Lime Pie is a big question mark. Because earlier it was though that Google would release the KLP in June 2013, but spotting this 4.3 build in this week of May, creates doubts over the early release of KLP. Will keep you posted regarding any further information on the subject. In the meantime kindly comment in what you think about the new 4.3 Android. I, ve just installed one of these DT 632V STORM IR 700TVL IP68 Dome cameras and to be honest i am really impressed with the quality for the price i paid, the night view is crystal clear aswell and the ptz function is fast and easy to use. • SMART IR : wide spreading 35 IR LED preventing white out at the center of image.